With the corner barely turned into a new year, surely the most important release of the next twelve months has surfaced in Mary Gauthier’s epic new album RIFLES AND ROSARY BEADS. Eleven co-writes with wounded veterans via the Song Writing with Soldiers Program is just the mere structure for this project. Its real heart and soul exists in the tortuous stories, sprinkled liberally with a fair degree of hope. Gauthier digs deep into her whole expression and presentation repertoire to produce a career body of work; successful at leaving the listener suitably informed and visibly moved. Throughout 2017, anticipation built as to where Mary Gauthier would next direct her lyrical prowess, with very short odds on the political discourse in her homeland from the evidence of her online outpourings. There is an element of politics in the background to the stories, but this is outweighed by the personal stance and the highly creative way they have been woven into the prime medium of the popular song. RIFLES AND ROSARY BEADS does create the impression of being a therapeutic project. Obviously, the veterans have been presented with the ultimate voice, while maybe the process itself took the artist’s mind away from society’s more visual divisions. From a listener’s perspective, each of the eleven tracks lands in a mist of stirring rhetoric, with perhaps two standing peerless in their effect. ‘Bullet Holes in the Sky’ could well be Mary Gauthier’s finest composition to date, a high accolade when you are up against ‘I Drink’ and ‘Christmas in Paradise’. Its stellar storytelling narrative is inspiring and probably the first time Nashville Tennessee has been the location for a song breaking down the feelings of one individual on November 11th. Like many of the songs, it is sung emphatically and possesses a decent melody to up the commercial ante. The other standout song is quite simply titled ‘Iraq’ and details the distressing experience afflicted to a female mechanic while on military duty in that country. The line ‘My enemy wasn’t Iraq’, paints a million pictures with just a handful of words. Quotable lyrics also frequently jump out across the album starting with ‘service was not a sacrifice’ in the album opener ‘Soldiering On’. Generally, the album’s theme centres around the aftermath of war, best analysed in the explicit title ‘The War After The War’. One assertion from devouring the lyrics via countless listens is that this is not designed to take sides on the pros and cons of war. Such an objective would probably need a different vehicle and it appears that many of the subjects are seeking social compensation rather than questioning the merits of their endeavours. From a musical perspective, Gauthier serves up lashing of her Southern empathy and at times, the vocals are reminiscent of Lucinda Williams at her soul seeking best. Intermittent harmonica blasts life into a couple of the songs, while occasional fiddle adds a touch of sombre morbidity. The overall studio enhancement has packaged a product ripe for listener enjoyment, thus maximising every opportunity for these songs to be widely heard. 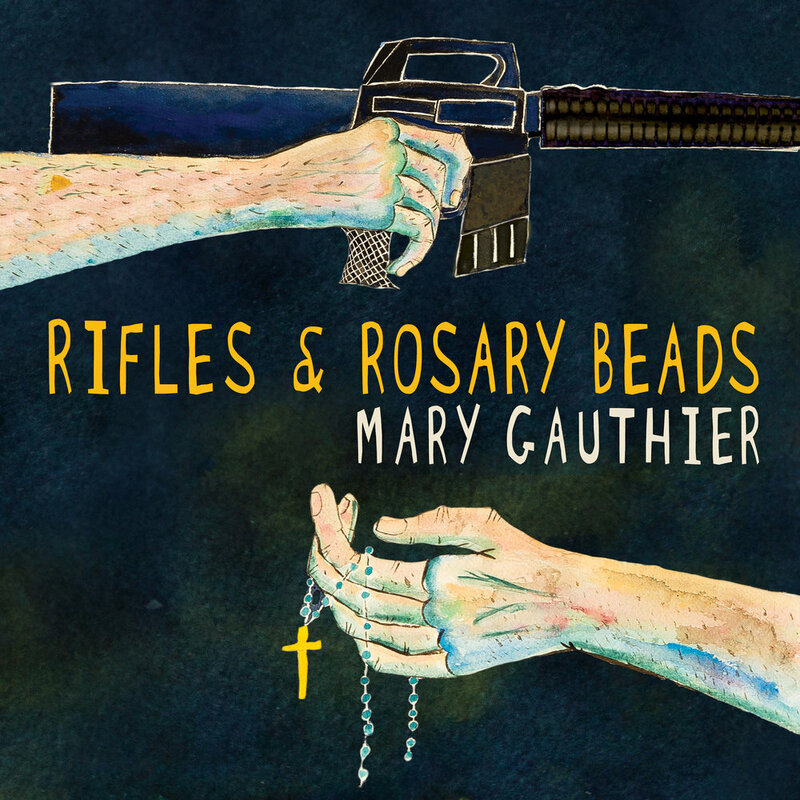 RIFLES AND ROSARY BEADS is every inch the trademark Mary Gauthier that has come to be a valued part of the American folk scene. In essence, these folk songs of 2018 are every bit important as any predecessor of the genre. This is an album with plenty to say and it is said with stirring fervour. Whatever the message, art is nothing without an audience and in this instance the recipient has been served exceedingly well with a record to be unequivocally enjoyed.